The books I have read the past ten days of 2016 are already disappearing from my desk quicker than I can consider writing about them. 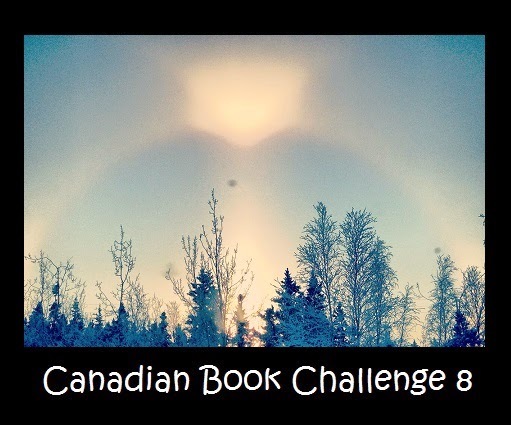 I blame my husband, who is in his wintertime mode of reading the long evenings away, as it is too dark and cold for his other-three-seasons outside occupations. He’s hot on my heels reading-wise this time of year, as I am spending much of my inside “free” time parked at the computer, working on twin time-consuming projects – our plant nursery website, and our upcoming regional performing arts festival, of which I am registrar and program director. No winter doldrums here! But I’ve looked in all of the obvious spots, and have re-gathered the January books-to-date. I doubt I’ll be writing at length about much this coming year – it promises to be fully as hectic as 2015 – so I am going to try instead to pull off some mini-reviews as I go along. Christmas with the Savages by Mary Clive ~ 1955. This edition: Puffin, 2015. Paperback. ISBN: 978-0-141-36112-3. 186 pages. Ordered in late November from England, this one arrived a few days too late for pre-Christmas reading, but it turned out not to really matter, as its time frame covered the extended after-Christmas weeks as well, and it felt most timely for a seasonal New Year’s read. This slim book is based on the childhood experiences of the author – Lady Mary Katherine Packenham as she was christened in 1907 – as an attempt to share with her grandchildren a vanished way of life. 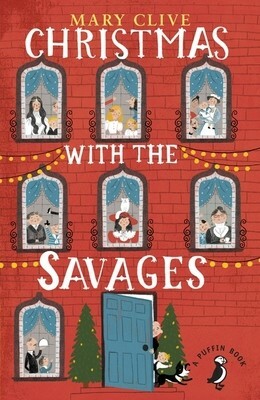 I had assumed its depiction of a rather spoiled, prim and proper solitary child going off to spend Christmas with a boisterous house full of other children was autobiographical, but as it turns out, the narrator “Evelyn” of Christmas with the Savages is a fictional creation, though all of the children are based on real-life models – Mary, her own brothers and sisters, and assorted cousins. Though marketed by Puffin as a “sweetly charming” juvenile Christmas story, this wasn’t that at all, being rather a gloves-off depiction of the true nature of children by a writer with little use for mawkish sentiment. Young Evelyn is quite a horrible prig of a child – she treats her governess and nursery maid with snobbish disdain, looks askance at the rowdy crowd of upper class brats she is expected to mingle with, and assiduously courts the company of the mostly disinterested grownups who live their parallel silk-lined lives alongside the slightly grotty sub-world of the nursery. This is quite a grand little book in its way, and though it wasn’t the “cosy” I assumed at first that it would be, it does have a dash or two of youthful joy, with Mary Clive’s unsentimental depiction of the world of Edwardian upper class childhood including many pleasurable events and the occasional thoughtful moment. Mary Clive wrote several other memoirs for adult readers, and I am now dead keen to get my hands on them, in particular Brought Out and Brought Up, her 1938 account of her season as a debutante in 1926. 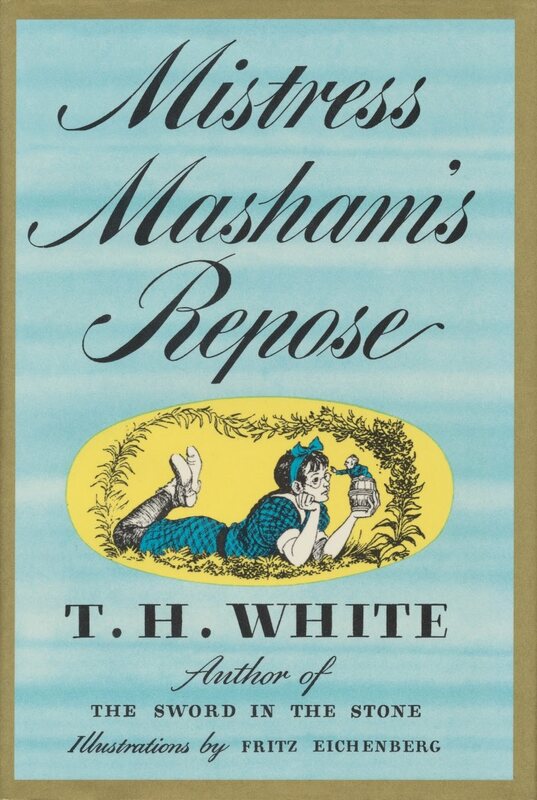 Mistress Masham’s Repose by T.H. White ~ 1946. This edition: Putnam, 1946. Illustrations by Fritz Eichenberg. Hardcover. 255 pages. This gloriously involved juvenile by the brilliant T.H. White is one I’ve read and re-read with great pleasure over the years, though somehow I never did read it aloud to my own children. Indeed, I rather wonder what the 21st century child would make of its arcane references to art, architecture, history and literature. I suspect a fair bit of what makes this tale so deeply funny would sail right over the heads of the present crop of youngsters, though an interested child could certainly find a lot of scope for click-research! 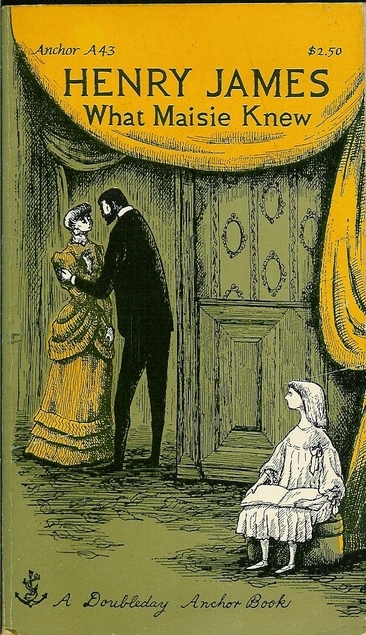 Orphaned ten-year-old Maria, last of her noble and once fantastically wealthy family, resides in a tiny corner of the crumbling Great House of the Malplaquet estate, attended to only by a solitary old family retainer, and under the sadistic “protection” of her malicious governess and her official guardian, a wicked vicar. One day, while out exploring the ornamental lake in a leaky punt, Maria decides to visit the tiny manmade island which is crowned by a now-decayed ornate ornamental temple, known as Mistress Masham’s Repose. What she stumbles upon there is a thriving population of Lilliputian people, descendents of escapees from those brought to England by the scheming but bumbling Captain Biddle, who displayed them as sideshow oddities in order to earn money to indulge in his drinking habit, way back in 1700-and-something. What happens when Maria decides to take on a philanthropist’s role to her discovery – and when her overseers inevitably discover the tiny people – makes for a lively, occasionally philosophically meandering, deeply appealing adventure tale. Good stuff. This one may well get a proper long post one day, full of quotes and samples of Eichenberg’s brilliantly detailed illustrations. What Maisie Knew by Henry James ~ 1897. This edition: Anchor Books, 1954. Paperback. 280 pages. Ah, Henry James. 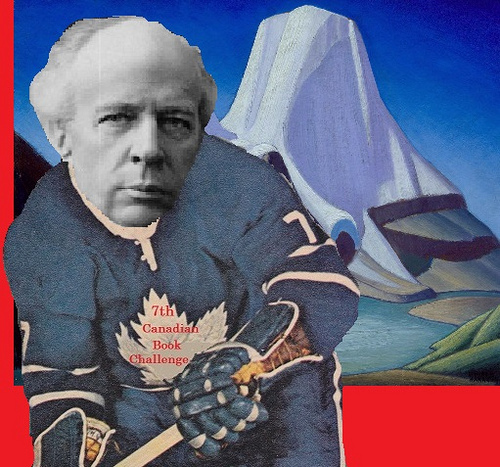 Master of the densely written social examination. In small doses, I rather enjoy him, though I am beyond grateful I’ve never had to approach his work in any sort of scholarly capacity. What Maise Knew should be subtitled Adults Behaving Badly, as it portrays some of the least likeable parents imaginable. Wee Maisie is the focus of her parent’s divorce trial, with each vying for possession of her small person in order to punish the other. A compromise is reached, six months per household, and Maisie shuttlecocks between mother and father, acquiring in the course of affairs two governesses, who shall feature strongly in her subsequent life. In a few years, Maisie’s terms of residence turn from being maneuvered for to being something to be avoided; now the parental game is to see how long each can force the other to care for the increasingly unwelcome child. In the course of things, Governess Number One becomes Maisie’s stepmother, while Governess Number Two tries to imbue the child with at least a semblance of moral sense, while giving her a modicum of steadfast love and stability in a brutally uncaring world. Parental partners come and go, until at last Maisie is disowned by both birth parents and ends up as the charge of two step parents, the kind but weak Sir Claude who has married and then been abandoned by Maisie’s mother, and the newly “freed” second wife of Maisie’s father. Complicated doesn’t begin to describe the relationships in this morbidly fascinating concoction, thought be some critics to be Henry James masterwork. I found it hard to look away, while at the same time struggling with the bogging-down complexities of James’ über-wordy prose. Pleasure reading? Well, sort of. It felt like something of an accomplishment merely to make it to its odd and only vaguely optimistic (in my opinion) end. And what did Maisie “know”? A heck of a lot, as it turns out. As a depiction of how an unwanted child remakes herself into a survivor, this is a telling little tale. 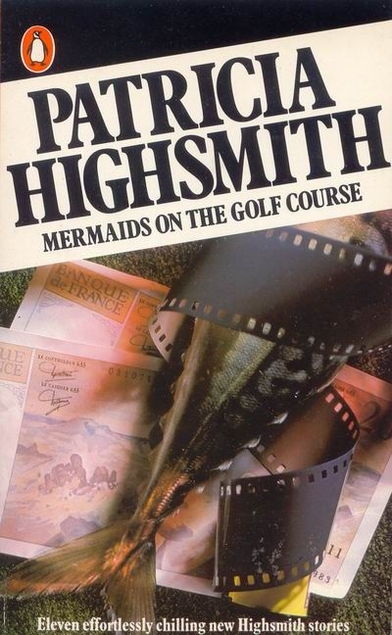 Mermaids on the Golf Course by Patricia Highsmith ~ 1985. This edition: Penguin, 1986. Paperback. 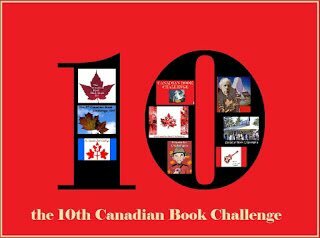 ISBN: 0-14-008790-7. 233 pages. A collection of eleven rather grim, sometimes macabre, only occasionally – and then only faintly – humorous short stories. Not really what I was in the mood for, as Highsmith here portrays her characters in the least positive light possible, and I just got sadder and sadder as I worked my way through these, hoping that the next one would strike short story gold. It wasn’t to be. This rather twisted moodiness was something Highsmith made rather a thing of in her novels as well, come to think of it. Mr. Ripley being what he was, for one example. Several of the stories end in suicide, and one of the most subtly disturbing concerns a Down’s Syndrome child’s secretly resentful father and a brutally random murder. People in these gloomy tales generally wander about with festering grievances which precipitate the plot lines. Endings fade into grey, and most of them left me feeling a bit suspended in space, as if I’d missed that last step – but with no subsequent bang! of a landing. Just floating down, landing with a suppressed whimper. Not a collection I’d whole heartedly recommend, though there are compensations in Highsmith’s more than competent styling. 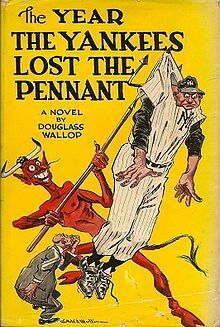 The Year the Yankees Lost the Pennant by Douglass Wallop ~1954. This edition: Norton, 1954. Hardcover. 250 pages. Now this was an unexpected pleasure. A happily romping fantasy concerning a middle-aged real estate salesman’s inadvertent pact with the devil, and his transformation into a younger baseball superstar who comes out of nowhere (literally!) in order to assist his favourite but dismally unsuccessful baseball team, the Washington Senators, break the clockwork-precise New York Yankees’ long winning streak. Now, I’m not at all a baseball fan, but one doesn’t have to be to appreciate this cheerfully light tale. Will our hero Joe be able to hold the devil to his bargain? And what of the middle-aged wife so staunchly dealing with her sudden loss of a husband with good natured stoicism? And then there is the most beautiful woman in the world, who falls in love with the reinvented Joe, and who has a Faustian dilemma of her own to work out. This is the best-selling novel behind the successful musical Damn Yankees, which I must confess to never having seen. But now I want to! 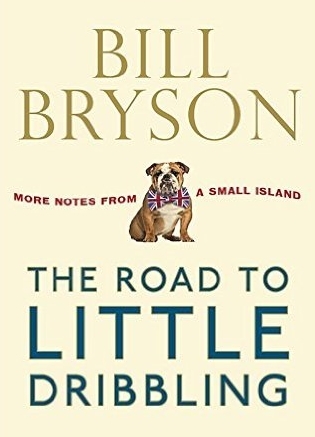 The Road to Little Dribbling: More Notes from a Small Island by Bill Bryson ~ 2015. This edition: Doubleday, 2015. Hardcover. ISBN: 978-0-385-68571-9. 384 pages. Do I need to talk about this one? Surely not, for those interested will likely already have read it, and the internet will of course be rife with reviews, though I haven’t actually checked to see, having purchased the book as a Christmas gift to my husband merely on spec, seeing as how we have enjoyed (to various degrees) everything else the author has ever written. Bill Bryson delivers the goods as expected, though this redux of the earlier Notes from a Small Island shows American-by-birth Mr. Bryson in full curmudgeon mode, versus his earlier honestly appreciative if frequently critical take on his adopted country, Great Britain. It was more than okay, but not one of his best. 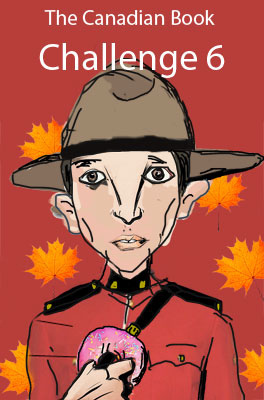 Has the Bryson bucket gone to the travel memoir well one time too many? I wonder. And I bailed out on two books. Just couldn’t get into them, though I may try again one day. Iris Murdoch’s The Green Knight defeated me at page 80, after a long rambling set-up filled with the complicated back stories of way too many characters. Weird things going on with phrasing and punctuation, too, which had me stopping in confusion and re-reading whole paragraphs to see if I was missing something. I wasn’t, but the editor certainly was. Browsing ahead, there are some intriguing passages, and I hope to return one day to enjoy them. Perhaps. One Winter in the Wilderness by Pat Cary Peek sounded extremely promising, being presented as the diary of Peek and her wildlife biologist husband one isolated winter in the Idaho back country at the Taylor Ranch Field Station. It might have picked up steam farther along, but the first few sections were just the tiniest bit plodding, as if the writer were trying a mite too hard – and mostly unsuccessfully – to turn her repetitious diary entries into something more literary. Apparently the Idaho Book of the Year in 1998. Fair enough. Back on the shelf, perhaps even into the giveaway box, for someone else to take a go at.